WONDERFULLY COMPACT is this modern signal on the LMS main line near Mirfield, Yorks. At the top are three searchlight lenses; each can show red, yellow or green. Under these is a division board denoting a lower group of signals which apply to the junction farther down the track. SIGNALS, as we have mentioned on an earlier page, not only give the driver permission to proceed, but they also indicate either the route or the speed at which he may travel. It is usual on British railways to have two signals at a junction. These signals are placed on bracket posts, one post 30 in higher than the other. When the upper signal is at “clear” it indicates that the route is set for the main line and that the driver may proceed along that route at a high speed. If the lower signal is “clear” it means that the points are set for the branch line, and that the train will be deviated from the straight; hence the engine driver knows that he must reduce his speed to negotiate the junction with safety. This method of indicating the direction in which the points are set is known as “route signalling”. A modern development which has met with great success in the USA and which is now being tried out in this country at Mirfield, Yorkshire, on the LMS, is “speed-signalling”, a system that gives the engine-driver an intimation of his permissible speed instead of an indication of the train’s route. The application of the multiple electric colour-light signal to signalling has been of considerable assistance to the engine driver, as the signal is more compact and can be fixed nearer the level of the driver’s eye than could the semaphore arm. This type of signal also has the advantage of showing the same indications by day as by night, and as it displays a powerful red, yellow or green beam of light of high intensity, it is almost impossible for the engine-driver to fail to catch sight of it, even in the densest of fogs. There are two main types of colour-light signals. One has a separate coloured lens system, and a lamp is provided for each aspect, as on the Southern Railway; and the other is the “searchlight” type. This signal has but one lens system and one lamp. A moving “spectacle” carrying a red, yellow and green filter is placed between the lamp and lens. This spectacle is actuated by means of a minute electric current in such a manner as to interpose either the red, yellow or green filter, as is required, and hence to give the colour necessary for the signal aspect. Such signals are installed between York and Northallerton on the LNER, at Mirfield on the LMS, and at Paddington on the GWR. Both of these types of signals have their own backgrounds, consisting of a sheet metal disk about 30 in. in diameter, The signal head is mounted on a steel tubular mast, which, in addition to carrying the main signal, also carries auxiliary signals, such as those used for shunting or to distinguish this type of signal from other types to be met with on the route. In addition, a white enamel plate with a circle in it is sometimes mounted on the same post. This tells the engine driver that there is a telephone at that signal, and should he be held there for any unduly long period, it is his responsibility to ring up the cabin and see if he can pass this signal at danger. But if a white enamel diamond-shaped plate is displayed, it indicates to an engine driver that if held at such a signal the signalman is aware of his presence. All such signals are equipped with apparatus to tell the signalman when a train is waiting, hence the driver need not send his fireman to the cabin to advise the signalman of his presence. With multiple colour-light signalling there have been many other improvements. One of the most important of these is the control, not only of the signals, but also of the points, by power. 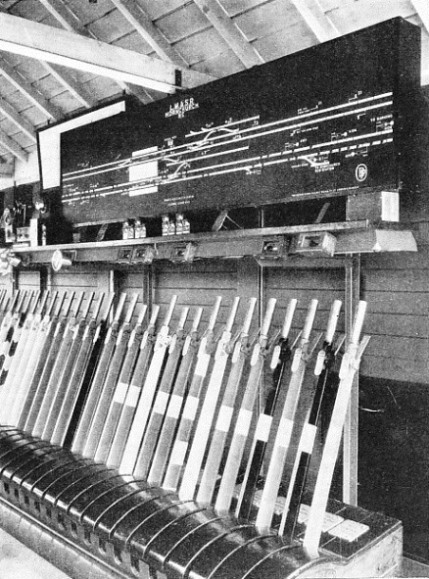 Modern methods are demonstrated in the design of the LNER signal box at Sessay Wood, near Thirsk, Yorkshire. This cabin is typical of British practice in the use of illuminated panels, showing in miniature that part of the railway system over which the signalman in charge exercises control. The diagram on the panel indicates by means of lights the exact position of any train within the signalman’s control. All signals and points are repeated by miniature lights on the panel. The remote points and all signals are operated by turning thumb switches on the panel, while the points adjacent to the cabin are worked by levers. The turn of a small switch by thumb and finger now achieves the same result that formerly required both hands and the whole weight of the signalman's body. The interlocking between signals and points is carried out electrically, so that should a switch be turned in incorrect sequence, no signal lighting or point movements can result. Among the most interesting types of signals in this country are those which are being successfully operated by the LMS Railway at Mirfield, Yorkshire, a strategic point in the flow of traffic between the big industrial areas of Lancashire and Yorkshire. AN ILLUMINATED TRACK DIAGRAM working in conjunction with the points and signals, is seen in this cabin at Hornchurch on the LMS Railway. The longer levers work the points in the vicinity of the cabin. The shorter levers operate the switches of the colour-light signals. Coloured, electrically-operated lamps, visible for 1,000 yards, are used, fixed one above the other at heights of 8 ft 6 in, 12 ft 6 in and 16 ft 6 in from rail level. When a train is signalled on the “high-speed” route the top light is operated; the middle light controls the “medium-speed” route, and the lowest light controls the “low-speed” route. The position of every train on the two and a half miles of track controlled by these signals is automatically indicated to the signalman in his box by means of an illuminated diagram. As a contrast to a busily-occupied stretch of track, such as that described above, several schemes have recently been introduced for signalling the line in isolated and lonely spots. “Searchlight” signals, as they are called, are lighted up only when the train is approaching within a certain distance of them, and are extinguished when the train has cleared the overlap section beyond. Any failure of the signal lamps is guarded against by a system in which they have to be tested as being in good order before the signalman can give the “all clear” signal into the section in advance. An important feature in all signalling is the track circuit, which consists of a length of railway line insulated from its adjacent lengths and supplied with electrical energy to indicate to the signalman whenever a train moves on to it. Track circuiting is the basis for successful and safe working of long-distance signalling, and it is now used extensively in conjunction with the previously-mentioned illuminated diagram, as well as at almost all signal cabins controlling sections of line carrying heavy traffic. The resistance offered by a steel rail carried in and on a cast-iron chair seated on a timber sleeper is sufficient to prevent a low-pressure electric current from “leaking” to earth. It is necessary, therefore, to feed a supply of current sufficiently low in pressure to the rails ; the pressure supplied requires to be slightly more than will overcome the combined measurable resistance to earth offered by the rails, chairs, sleepers and ballast. This obtained, it is possible to provide any desired number of track circuited portions of line, and to mark all the necessary parts required for point and signal control. A MODERN SIGNAL BOX at Thirsk, on the route of the “Flying Scotsman”. Fitted with the most up-to-date electrical devices, it replaces five signal boxes of the older type. All rail joints (other than those which are insulated) are bonded - that is linked together with a copper conductor to ensure a free path for the electrical current. Vehicle-wheel flanges also are bonded to the axles, so that when a pair of wheels gets on to a track, the current, following the shortest path, is “shunted”, and any required indication given. So long as a track circuit is occupied, the points themselves and the point and signal levers are electrically locked, and the signal lights controlled. Even if the electric lock on the levers be tampered with and the lever pulled, the train would still refuse to proceed, and neither points nor signals would change; the forward progression of a train also causes the track circuits to put the signals to danger one by one immediately the whole train has passed each signal. If a rail should break, or if a piece of metal should fall across the rails, the track would operate in exactly the same way as if a train were occupying the rails. In certain instances where it is desired that the track circuit locking shall function only for a predetermined period, time element relays are used. A disk is made to rotate by magnetic means, thus loading a spring which can be adjusted to cause any desired cessation, or flow of electrical current for a period of from 1 to 60 seconds. Track circuits are also utilized for approach-controlling and approach-lighting signals. The former arrangement is used to slow approaching trains, because the signal does not change colour (even when its lever is pulled) until the leading vehicle is close to it; in the latter event the signals show no light until the requisite approach track circuit has been occupied. Numbers of these air-operated points are in service at the Great Western Railway Company’s goods sidings at Banbury, in Oxfordshire. This type of yard is known as a “hump” marshalling yard. Railway goods yards of this type are located in a central position, and are designed for the reception of goods-trains and the quick sorting and reassembly of the wagons constituting the trains into fresh groups, which make up new trains, each destined for different places. THE CONTROL PANEL. 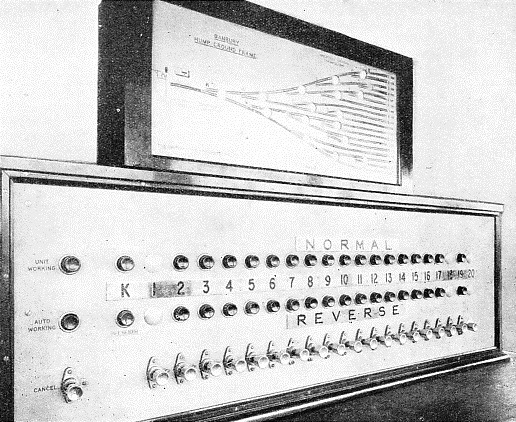 This illuminated control panel at Sessay Wood, on the LNER, is provided with thumb-switches governing the signals and the points. The progress of a train over any section of the track is marked by the lighting of miniature lamps on the diagram, enabling the signalman to follow the movements of the train while it is under his control. Originally, these yards were arranged to be level, the wagons being shunted into the various sidings by means of a locomotive; but it has been proved advantageous, with the large yards, to provide a so-called “hump” in the track to the sidings. The hump is approached by an easy incline up which the train is pushed. As the wagons reach the crest of the hump they are uncoupled and allowed to run to their respective sidings by gravity. For convenience of operation, the points are controlled from a central cabin. At Banbury and Rogerstone on the GWR, and at Mottram on the LNER, the speed of the wagons as they run into the sidings is controlled by brakesmen, who run with the wagons for a short distance and set the brakes to such a position as to bring the wagons to rest at the required distance in the siding. Owing to the steepness of the inclines in some yards designed to speed up the working, it is found necessary to replace brakesmen by means of “car retarders”, which are devices designed to grip the flanges of a wagon as it passes through, thus retarding it to the required speed. A yard of this nature is Whitemoor, on the LNER. 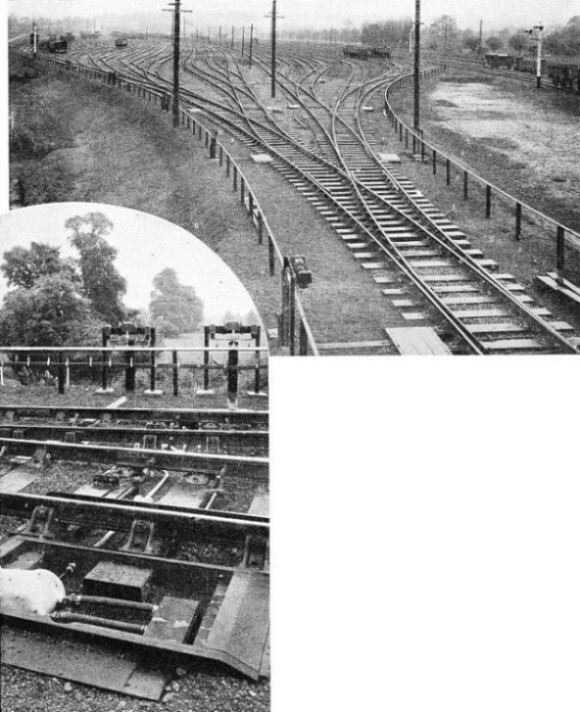 In modern practice, as at Banbury, the points continuously branch until they become sidings. By this method the points may also be more easily grouped in the neighbourhood of the control cabin. Of the 19 sidings provided at Banbury, 10 are reached over five points, 7 over four, and 2 over three points. Each pair of points is provided with a point mechanism, and control valves for the supply of compressed air to the operating cylinders, which move the point blades. Each point is protected by an electric track circuit, which ensures that the points are correctly set. In the signal-cabin, in addition to the point control panel, a diagram of the yard is provided indicating the track circuits and points operated. At Banbury the control panel is designed for either automatic or independent-unit operation of the points. The push buttons in the bottom row are used for automatic working and the others for unit working. SORTING GOODS WAGONS is simplified by this control panel in the signal cabin at the Banbury sidings, in Oxfordshire. The pressing of a button changes the points so that a wagon shunted past the control cabin is automatically run into its correct siding. The push buttons for automatic working are fitted with an electric lock. When the push button is pressed in it is locked in the depressed position until the electric lock is released, either by the first track circuit being occupied, or by the “cancel” button being pressed. The buttons are mechanically interlocked so that no two can be simultaneously depressed. An alternative method of operating the points is provided by means of a series of single-pole double-throw switches. Each of these operates a set of points independently of any track control. The method of controlling the points as independent units is brought into operation by depressing the change-over switch button marked “Unit”. Thus there is no possibility of the two systems being worked simultaneously. Pressing the button marked “Auto” locks all the other double-throw switches in a central position. The shifting of points to transfer a train from one line to another can be carried out entirely by electricity. Electric switchgear sets in motion the motor which moves the tapered rail ends or “point blades” as required, locking them in place to guard against derailment of the train when passing over the points. In addition to this, electric contacts are made which ensure that the indications given by the signals shall be in correct relationship to the route set by the rails. The point mechanism comprises a self-contained unit in a cast-iron box, which is bolted to the track sleepers, extra long sleepers being provided for this at the points. The electric motor is attached to one end of the main casing, which contains gearing for actuating the points and lock. This machine can unlock the points, reverse them. and lock them again in two to three and a half seconds. The casing of the mechanism is provided with a waterproof cover which can be locked if required. The electric motor, which is bolted to the mechanism box, is also in a watertight case with a locked cover, so that it can work in all weathers. BANBURY HUMP YARDS are among the largest in England. This photograph was taken outside the control cabin, which is situated beside the line shown in the foreground. Opposite the cabin is the hump - a small hill over which the single line passes before branching into the sidings. The wagons are pushed over the hump, and then they run by gravity to their sidings. COMPRESSED AIR works these points, which are controlled by the electrical apparatus seen on top of the fence in the background. The top rail of this fence is the air pipe-line conveying compressed air to the operating cylinders, one of which is shown in the left foreground of this picture. The motor, through a friction clutch (similar to that on a motor car) and a bevel pinion, drives a large bevel wheel, on the underside of which is a small cog-wheel. This cog-wheel, or spur-pinion, drives the large toothed wheel in the centre of the mechanism case. The main toothed wheel is provided on its underside with two driving-pins fitted with rollers, which in turn operate a “lock drive-bar”. This bar projects from the end of the mechanism case opposite the motor, and its function is to lock the points in position when they have been moved. The point movement is made by means of a “point throw-bar” which projects from either side of the mechanism case. The point throw-bar is moved by one of the rollers (made extra long for the purpose) on the main toothed wheel. The action of this roller resembles that of a key in a lock, the point throw-bar acting as the tongue moving in and out of the doorpost. In order to shift the points, therefore, a switch in the distant signal box is turned, the motor then moving the lock-drive bar by means of the gearing, to unlock the points. The motor continues to turn (for a brief moment only) and moves the point throw-bar, thus shifting the points, which are automatically locked in their new position. The mechanism cuts off the electric current to the motor when the points have been moved and locked. A handle can be attached to the main wheel of the mechanism to shift the point by hand if necessary. The final duty of the point machine is to report to the signalman that the points have been moved as required, and that they have been duly locked safely in their new position. This is done by “point detectors” - strips of steel attached to each of the point tongues and, if necessary, to the point locking gear. These “detectors” are in electrical contact with the electric operating circuit and also with the colour-light signals, so that permission cannot be given to a driver to proceed, until the points are set for the train. In the improvement of signalling by new methods there is one great difficulty which is not generally realized, but which is of the utmost importance. The problem lies in the installing of new and different indicators on a route without some risk of confusion to drivers long familiar with the old signals. This difficulty is one of the most important factors governing the rate at which old signal systems are being replaced by new. Obviously it is essential that any new method should be capable of working in conjunction with the other system during the necessary transition period. MODERN POINT MECHANISM. The electric point machine illustrated left comprises: (A) the electric motor; (B) large bevel wheel with crank for hand operation; (C) main gearwheel; (D) point throw-bar; (E) electric contacts controlling motor; (F) facing point-lock; (G) detectors; (H) point lock-bar. There are so many different improvements in signalling that it is impossible to indicate them all, but enough has been said to disclose the thoroughness of the search for better methods. It goes on, ceaselessly, in every branch of the complex system. Even the simple semaphore indicator has been radically improved, since the newer ones do not drop at an angle, to indicate “Clear”, but they move upwards instead of downwards from tile horizontal. The reason is a good one - if a break occurs anywhere, and the signal falls, it now falls into the horizontal or “Danger” position, instead of dropping, as before, to indicate “Clear”. Thus a failure will now tend to stop a train, instead of permitting it to go forward, as a failure on the old signal might have done. The positions of the ordinary semaphore arm are given at night by “spectacles”, which are attached to the arm and pass in front of a lamp, a red light denoting “Danger”, a green “Clear”. Thus day and night signals depend upon visibility. 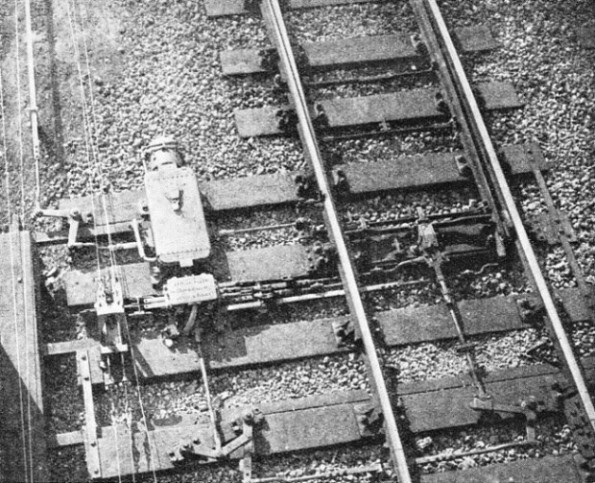 An ingenious method of ensuring that signals at “Danger” shall not be passed by a driver is in operation on the Great Western Railway between Paddington and Reading. This system gives to the engine driver in the cab of the locomotive audible signals, corresponding to the position of the distant signals. When the distant signal is at the “all right” position a bell rings, and when the distant signal is at “caution” a siren sounds and at the same time the brakes are automatically applied. The application of the brakes and the sounding of the siren continue until the engine driver “acknowledges” the signal by lifting a small handle on the apparatus in the engine cab. THE POINT MACHINE in service. The mechanism is shown complete with its locked covers bolted to the sleepers alongside the track. The various attachments to the blades and locking devices are clearly indicated. On main lines carrying express traffic the colour-light signal has come to stay, and will gradually displace the semaphore arm. 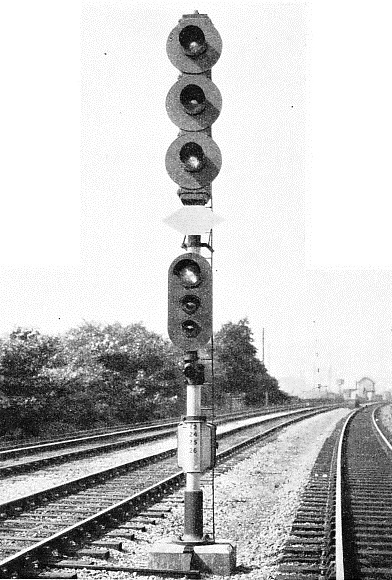 Owing chiefly to difficulties of its background, the semaphore signal must be carried on a high post in many localities, and cannot be seen in fog; whereas its colour-light equivalent works best at a height of about 12 ft above rail level, is independent of background, has a range of 1,000 yards in sunshine, and can penetrate the densest fog. The searchlight type of signal gives a beam of 15,000 candle power, and needs only a 3-watt lamp. All modern signalling aims at greater safety, and at the elimination of possible error. This tendency is clear if we recall the main trend of development - from few to many signals, and from the independent to the interlocked types.